When your body is involved in trauma, your neck is one of the body's most vulnerable areas. Whiplash, the hard and fast forward-backward movement of the neck can cause pain that can last well after other injuries have healed. To understand why your neck is so sore, it helps to know the anatomy involved. Technically your neck is called the cervical spine, which begins at the base of the skull. 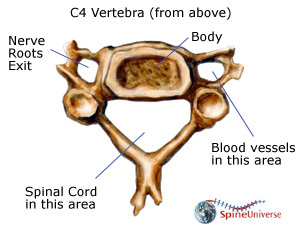 It contains 7 small vertebrae (bones), which doctors label C1 to C7 (the ‘C’ means cervical). The numbers 1 to 7 indicate the level of the vertebrae. C1 is closest to the skull, while C7 is closest to the chest. In between each vertebra are tough fibrous shock-absorbing pads called the intervertebral discs. (These discs are what slide back and forth during the trauma.) Each disc is made up of a tire-like outer band and a gel-like inner substance. Just as whiplash can be a complicated diagnosis, the parts of the cervical spine are quite complex. In addition to bones and discs, it includes the upper region of the spinal cord, 8 nerve roots, an elaborate system of arteries and veins, 32 muscles for strength, and numerous ligaments. The joints, muscles, and ligaments assist with movement and stabilize the neck. Is it any surprise that you feel sore, with so many important parts in your cervical spine? Remarkably, the cervical spine supports the full weight of your head, which is usually about 15 pounds—yet no other region of the spine has such freedom of movement. Whiplash causes those 15 pounds to be dramatically tossed frontwards then backwards, which is one important reason to wear seatbelts properly and use airbags whenever possible. The cervical spine can move your head in nearly every direction: 90˚ of forward motion, 90˚ of backward motion, 180˚ of side to side motion, and almost 120˚ of tilt to either shoulder. Unfortunately, this flexibility makes the neck very susceptible to pain and injury, such as whiplash.